By conducting fundamental experiments in our laboratories, we can investigate the elementary processes experienced by plasma-facing components in a fusion environment. The surface composition, chemistry, and morphology can be probed while independently controlling the vacuum conditions, surface temperature, and incident neutral/ion flux. Scientific topics of interest include measurements of deuterium uptake and retention in lithium while exposed to oxygen and carbon contamination, oxidation of lithium films, and wetting of liquid metals. Explore the topics below for further details about the current research efforts. Information for prospective students interested in our laboratories can be found on our Opportunities page. 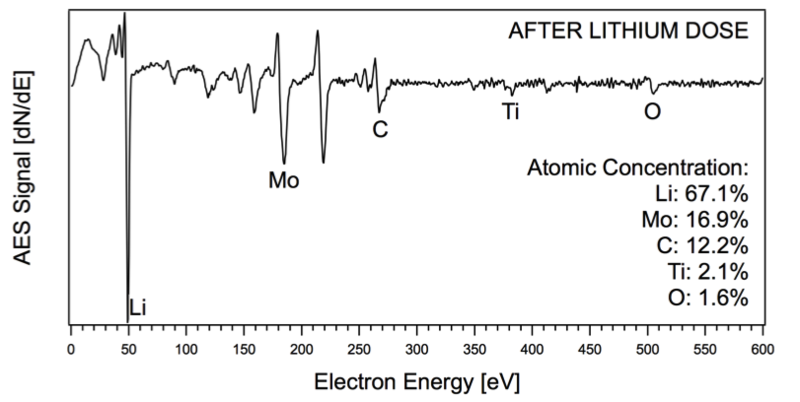 Solid lithium and a molybdenum alloy (TZM) coated with lithium have been examined using X-ray photoelectron spectroscopy, temperature programmed desorption, and Auger electron spectroscopy both in ultrahigh vacuum conditions and after exposure to reactive gases. Lithium surfaces near room temperature were fully oxidized after exposure to 1-2 Langmuirs (1 L = 10-6 Torr-s) of oxygen or water vapor. 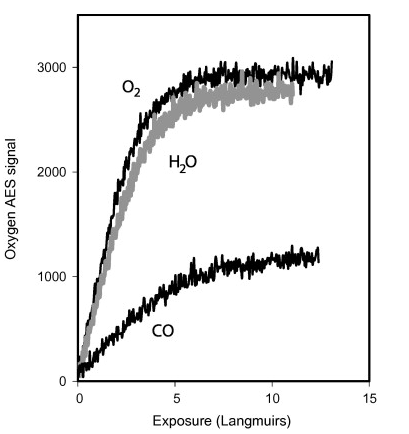 The oxidation rate by carbon monoxide was four times less. Lithiated PFC surfaces in tokamaks will be oxidized in about 100 s depending on the tokamak vacuum conditions. A paper describing these results will appear in the Journal of Nuclear Materials. The use of lithium conditioning on PFCs has resulted in reduced recycling and enhanced plasma performance on many fusion devices including TFTR, T11-M, FTU, CDX-U, LTX, TJ-II, and NSTX. 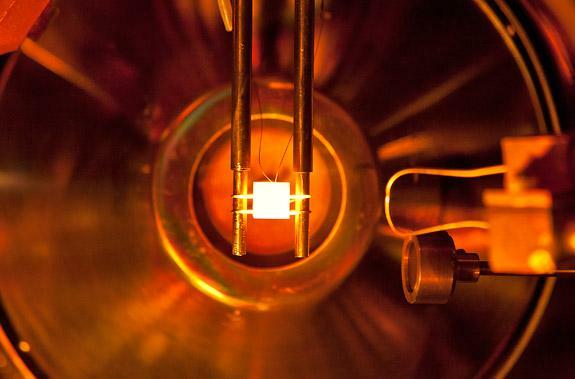 A key component to the improvement in plasma performance is deuterium uptake and retention in lithium; however, this process is not well understood in the complex tokamak environment, and contamination by residual gases is believed to limit the pumping ability of lithium. The aim of this work is to establish the optimal temperature range for deuterium uptake on lithiated plasma-facing components and determine the effect of contaminants including carbon and oxygen. The current research effort consists of experiments in which lithium-coated molybdenum substrates are exposed to deuterium and the resulting uptake of D2, D, and D+ are measured using temperature-programmed desorption. Measurements of this system with carbon films and surface contamination with residual gases will elucidate the role of oxygen and carbon in deuterium uptake in solid and liquid lithium-coated substrates. The presence of grain boundaries and other nonuniformities in tokamak-relevant materials such as TZM-molybdenum alloy may contaminate the surface with carbon and cause oxidation of the lithium deposited on these substrates. 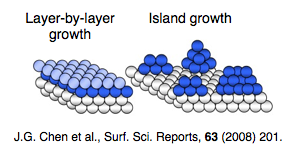 A comparison of the Li/TZM system with lithium deposited on single-crystal molybdenum with and without surface carbon and oxygen will elucidate the effects of the grain boundaries in TZM. Wetting is a key factor in the design and operation of liquid metal plasma-facing components. Previous work has demonstrated the utility of scanning Auger microscopy in the study of wetting and spreading of tin on aluminum interfaces. We plan to evaporate lithium on various substrates including single-crystal molybdenum, TZM-molybdenum alloy, and stainless steel and use the Microlab 310-F scanning Auger microprobe to study the lithium wetting characteristics as a function of substrate temperature, carbon surface contamination, and various surface cleaning techniques. The flow of liquid metals offers solutions to significant problems of the plasma-facing materials for fusion energy systems. Candidate metals include lithium, tin, gallium, and their eutectic combinations. However, such liquid metal solutions can only be designed efficiently if a range of scientific and engineering issues are resolved that require advances in fundamental fluid dynamics, materials science and surface science. A scientifically diverse team was assembled with the expertise to advance fundamental understanding of these issues. Princeton University participants come from four departments: Steve Bernasek (Chemistry), Emily A. Carter (PACM and MAE), Pablo G. Debenedetti (CBE), Bruce E. Koel (CBE), Athanassios Z. Panagiotopoulos (CBE), Howard A. Stone (MAE). Our PPPL collaborators include Robert Goldston, Richard P. Majeski, and Charles H. Skinner. This team was funded in September 2012 by the Department of Energy Office of Fusion Energy Science through the grant "Liquid Metals as Plasma-Facing Materials for Fusion Energy Systems: From Atoms to Tokamaks." In our proposed research we will investigate a range of significant and timely problems relevant to current and proposed engineering designs for fusion reactors, including high-heat flux configurations that are being considered by leading fusion energy groups world-wide. Consequently, using experimental and theoretical tools spanning atomistic to continuum descriptions of liquid metals, and bridging surface chemistry, wetting/dewetting and flow, we will advance the science and engineering of fusion energy materials and systems.